This evening I went to the baseball park to watch my brother’s baseball game. What was more interesting than the game, was the conversation my parents were having with some other parents on the bleachers about Osama Bin Laden’s death. Ha! 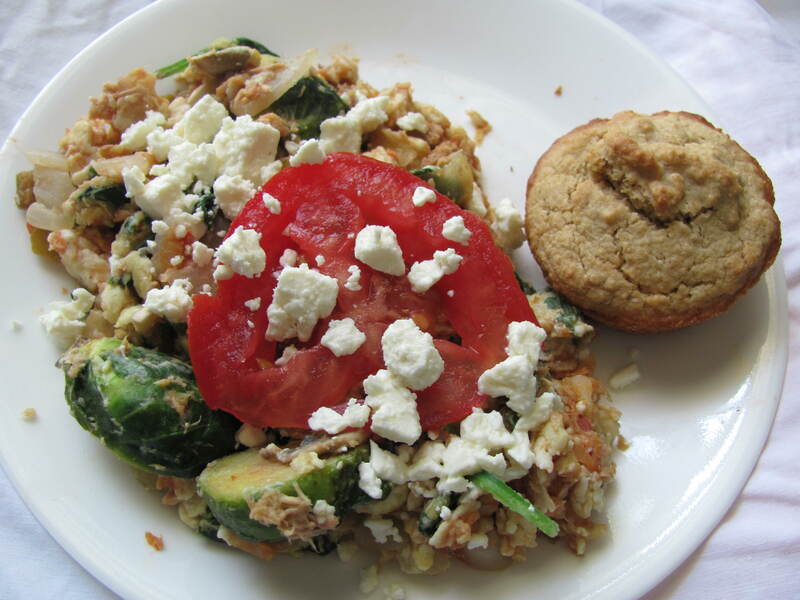 Egg white + veggie scramble. With mushroom, onion, brussels and topped with a little feta and a tomato slice. And the last oat flour muffin on the side. The oat flour muffin was 3 days old now, and was pretty dry. Next time I make the muffins, I might add more liquid + less flour, or add an extra egg. Usually I make my green monsters with 1 cup of milk, but this time I omitted it and had an extremely creamy and thick texture! Plus it was more sweet and flavorful, since the milk didn’t take away from the flavor! Yes, I admit it. The whey chocolate protein powder DOES have fructose in it, but it’s the very last ingredient on the list, so it really has almost NO sugar in it! So technically my sugar free month is really just 99% sugar free month! A stuffed date , devoured right before we left for the ball fields. 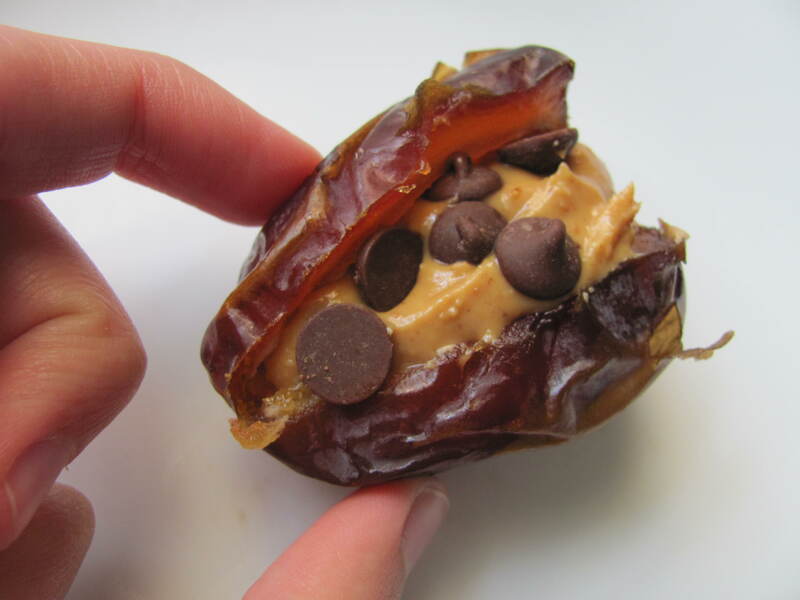 I warmed the date up in the microwave for a few seconds before adding the peanut butter and carob chips, so it was all warm and gooey. Me likey. I have a 2.5 mile run tomorrow for Couch To 5k. Identical to the one I did on Monday. That was the hardest run I’ve ever done and I have to admit I’m a little scared about doing it again tomorrow. I’m going to try and wake up pretty early to do it, while it’s still cool and dark out. That’s always a fun time to run, I want to see the sunrise! My mom has a gym membership and she can bring 1-2 friends (me) every time she goes. But we don’t go to the gym, so I have just been running outside around our neighborhood. I like treadmills though, but I think running outside is good when you’re preparing for an outdoor race, like I am! I still haven’t actually found or picked a 5k to run when I am ready, I need to get on that! Treadmill or outside running? -Depends for me. Treadmills are excellent when doing HITT. Almond or peanut butter? -Peanut all the way, for me! Mmmm stuffed dates are one of my favs. I had a few for snackage tonight!! Almond or peanut butter? Do I really have to choose? I think I actually prefer treadmill running to outdoor running. Is it just me or does it seem harder outside? Even on a perfectly flat path! Peanut butter all the way! Gosh, your Green Monsta sounds AMAZING! 🙂 I have got to get me some chocolate protein powder! I love outside running. I need that change of scenery and the challenge from road running. So you had your GM with out milk?????? Yep, I had my GM with out milk. 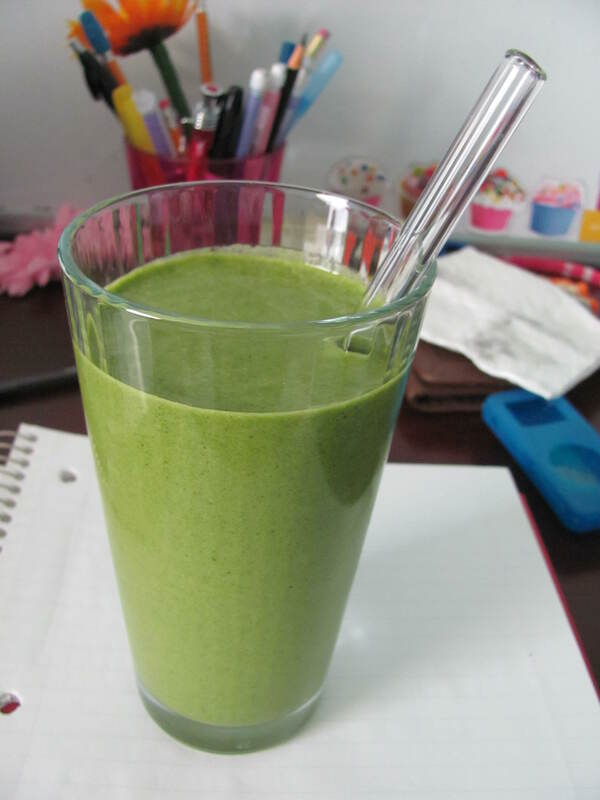 Next time, I would first blend the frozen banana, then add spinach and ice gradually. peanut butter! love that DATE girl 😀 😀 i defss prefer outdoor running but treadmills for intervals and hill runs! That stuffed date looks scrumptious! For me, running outside is King! Not only is it great preparation for outdoor races but it also feels great to just enjoy the warm air and scenery. I do, however, like treadmills for HIIT and workouts where I have to keep an eye on my mile splits. Good luck on your run!!!!! Treadmills are great for doing speed workouts yes, however they can get so boring sometimes. Although when it’s raining I never run outside no thanks to hypothermia. If I run, it’s gotta be outside. I get too distracted and bored on a treadmill, not to mention I’m kind of scared to run on them. I have this fear that I’m going to miss my footing and fall or something. That date basically looks like heaven. And I definitely load up on the spinach, too. Sometimes I wonder if it’s normal. Treadmills are a bit intimidating! Especially if you’re going like really fast! I don’t think it’s normal how much spinach I put in that green monster, filled the Vitamix all the way to the top! aaand I’m honestly a treadmill girl. I can watch that darned TV for hours and just runrunrun. 🙂 Running outside sometimes has less distractions. Most people tell me I’m crazy. Peanut Butter > Almond butter. Though I like flavored almond butters better than flavored peanut butters. You’re doing so well with sugar free! I think that would be so hard! Keep it up with the running too. I promise it will pay off! For every hard day you will have a really good day in the future. I love running outside but the weather has to be perfect, which often isn’t the case in Chicago! I know you’ll rock that run tomorrow! Running outsite is soooo much easier; believe me! I can run a ridiculous ton faster when I’m outdoors and enjoying the scenery and amazing weather! (Assuming it is, in fact, amazing weather anyway!) hehe I’m so proud of you for keeping up with your couch to 5k plan! I can’t wait to hear how you do when you finally complete a race…you’ll LOVE the feeling you get afterwards; words can not describe!! PS love the simplicity of the smoothie-I make mine like that basically all the time, but with about 1/3 cup soymilk. Do you not use ANY liquid? I feel like it wouldn’t even blend!?! It’s basically just banana soft serve with spinach and protein powder! So it does blend! Ooo warming up the date is a great idea! I gotta try that. Good luck on your run, I know you can do it! I love outside runs because there’s just so much more variety, but I’ll do speedwork on the treadmill sometimes. I used to think I enjoyed treadmill running but I’ve started running outside more now the weather is getting better and I love it!! Much better than treadmill running. and definately peanut butter, I thought I would buy some almond butter to try but no where near as good as peanut butter!